This entry was posted on May 1, 2011 at 10:51 am and is filed under FILM with tags Eric Rohmer, Grace Elliott, Jean-Claude Dreyfus, Le Duc et l'Anglaise, Lucy Russell, The Lady and the Duke. You can follow any responses to this entry through the RSS 2.0 feed. You can leave a response, or trackback from your own site. Dreyfus is REALLY GOOD though — I’d say praise is due to the late ER for overlooking the man’s usual associations and casting him on his abilities. After all, isn’t that what the French Revolution was all about? When he read the diary Rohmer thought he’d be able to use actual locations. But on further examination he discovered that buildings he thought were around in that period weren’t there. So he came up with this magnificent solution. Late period Rohmer gets REALLy experimental. Not only this film but his incredible spy thriller Triple Agent. In it Rohmer pulls off what Hitchcock tried — and failed — to do in Torn Curtain and Topaz. Triple Agent is high on my list. Plus The Green Ray and his last one, The Romance of Celadon and whatsisname. The CG certainly doesn’t feel like a compromise, in the way that using alternative locations would have been. The Green Ray goes out on Film4 once in a while (usually Thursday mornings), but not this week – they’ve got L’avventura. 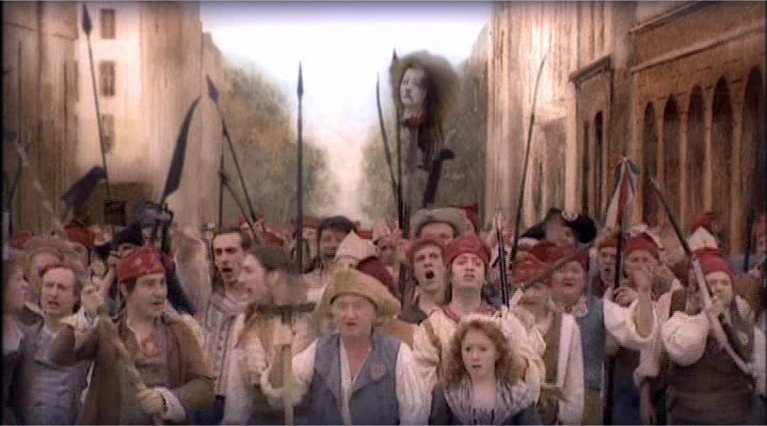 There are actually very few films on the French Revolution(the same for the American Revolution by the way). Among the great ones, Rohmer’s film is at one with Renoir’s LA MARSEILLAISE(a movie where Renoir went all out in research to the point of inserting dialogue from old pamphlets to his characters) and Griffith’s ORPHANS OF THE STORM(which Rohmer said was his major influence). 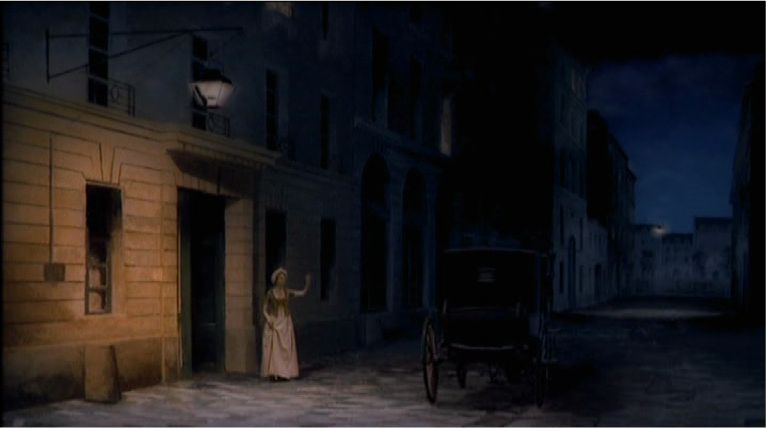 Rohmer boasts that his film is the first to really show what Paris was like during the Revolution. The answer is that it’s not yet Paris. 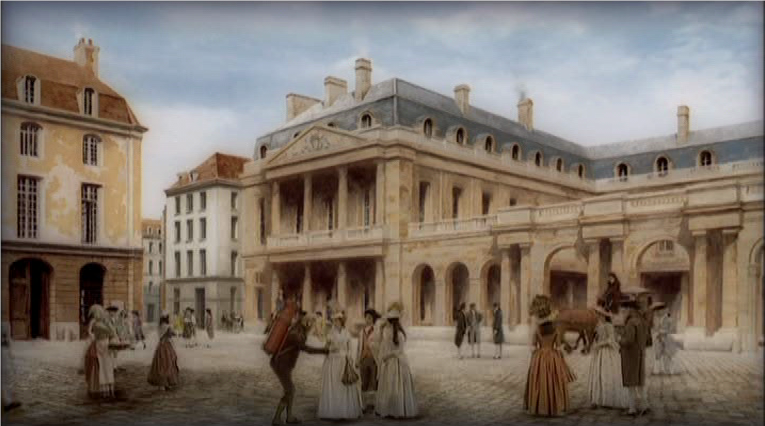 A city that really burgeoned in the 19th Century helped in part by Haussmann’s re-ordering of the city, specifically to prevent certain maneuvers used by the sans-cullotes(didn’t work as subsequent events have established). Rohmer’s stylized approach to period detail follows his adaptations in the 70s of Perceval and DIE MARQUISE VON O…(for the latter film he took four years off learning 18th Century German to write the dialogues, though the story has a Russian Count and an Italian noblewoman). But what makes THE LADY AND THE DUKE and TRIPLE AGENT unusual is that these are historical events he’s chronicling. TRIPLE AGENT is weird because even if it’s set in the 20th Century, it’s got even less resources than Grace Elliot’s story. Simply because there’s no diary. Rohmer uses newsreels to give the same sense of actuality to the proceedings. Die Marquise is great — I read the story first and felt he did an incredible job of capturing its intricacies, although he soft-pedals the incestuous side which is quite blatant in Kleist. Seems like I’m slowly working through the more aberrant Rohmers, though I did see Ma Nuit Chez Maud as a teen and seem to recall enjoying it. I’ll plunge into his conversation pieces when I’m done with the weirdies. Four Adventures of Reinette and Mirabelle and The Tree The Mayor and The Mediatheque are Rohmer at his weirdest. Thanks for the tips. TTTM&TM might take a bit of digging up, but I’m sure I can find it somewhere. I think you’re onto something. Also, script and visuals put the film into the past tense, unlike all those period movies which are trying desperately to look like documentaries. The only sense of immediacy is in the performances, I think. 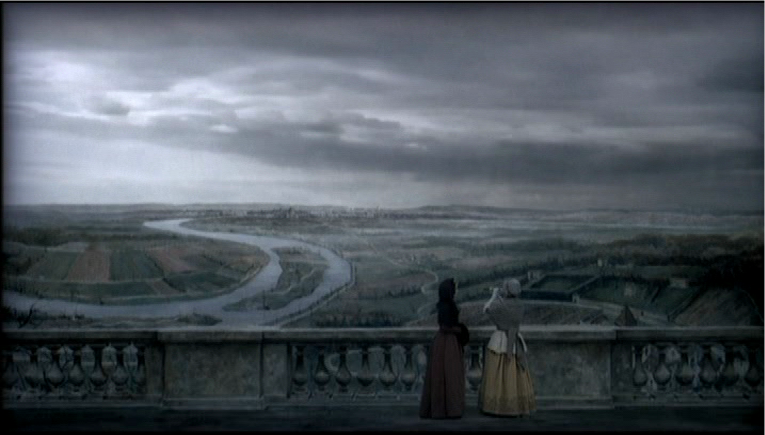 Speaking of French Revolution movies, can I put in a word for the 1938 film of MARIE ANTOINETTE? It has the lovely Norma Shearer as the Queen, the inimitable Robert Morley as King Louis, the dashing Tyrone Power as her lover and the slimy (and deeply gay) Joseph Schildkraut as the villainous Duc d’Orleans. All wrapped in MGM’s most lavish production of the 30s. Corny and campy, I know…but sheer bliss for a sentimental old-style royalist. Hell, I even love the Sofia Coppola film! Oh, and Jacques Demy’s LADY OSCAR is great fun too. Lady Oscar is completely nuts. 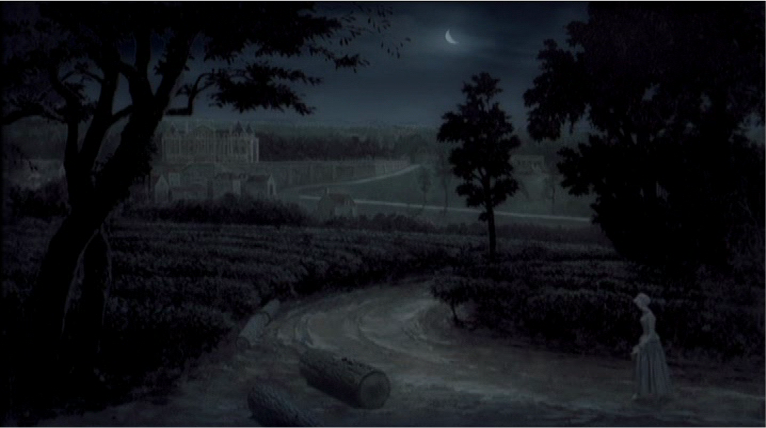 I’m not convinced anything about it WORKS, but it hits a peculiar note, as a French adaptation of a Japanese manga about French history, that’s pretty unique.